LOS ANGELES (January 9, 2018) – Two-division world champion Danny “Swift” Garcia and former world champion Brandon “Bam Bam” Rios went face-to-face for the first time Tuesday at a press conference in Los Angeles to announce their main event showdown taking place Saturday, Feb. 17 live on SHOWTIME from Mandalay Bay Events Center in Las Vegas and presented by Premier Boxing Champions. 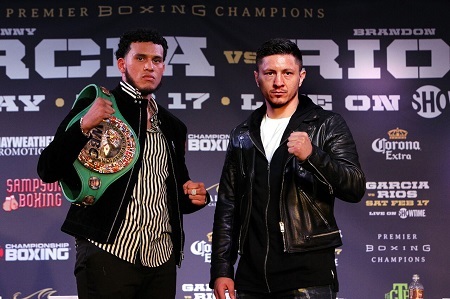 Also in attendance Tuesday were WBC Super Middleweight World Champion David Benavidez and top contender Ronald Gavril, who meet in a rematch of their exciting world title fight from September in the co-feature of the telecast. Tickets for the live event, which is promoted by Mayweather Promotions and TGB Promotions, are on sale now and are available at AXS.com. “I feel really good mentally and physically right now. My body is rested and ready to have a great 2018 starting February 17. “You have to be focused to succeed in a fight like this and I think Brandon Rios knows that. I’m training hard so I hope he is too. I’m never going to take a fight off. 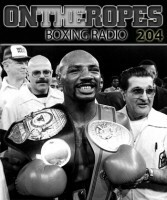 “This is a classic fight of a boxer puncher versus a brawler. I’m going to be prepared for everything and start 2018 off right. I have to be the fighter I’ve always been. “I’m healthy and strong and ready to fight. 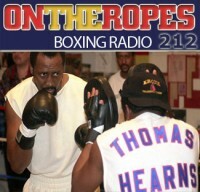 I’m putting the loss to Keith Thurman behind me and moving forward. 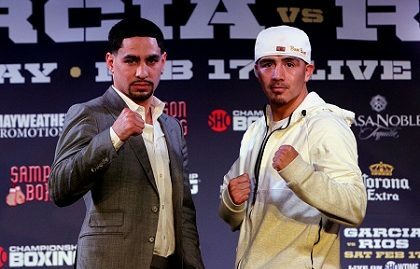 I have to focus on being Danny Garcia on February 17. I can’t press and try to do too much, I just have to get the win. “We were both champions at the same time at 140-pounds and we didn’t get a chance to fight then, but it’s all about timing in boxing. Things tend to work out and now we’re ready to go head-to-head. 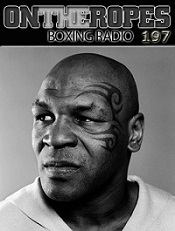 “I never back down and I know that Brandon Rios sees that in me. I always come to fight. It’s going to be a great matchup with our styles and our determination. “I like watching the last three fights of my opponent. I think it gives me a good indication of what he’s going to look like on fight night. I’ve been watching tape of my last fight too so we can get a great game plan together. “I felt like I fought a good fight against Thurman. He didn’t really engage. I thought after the fourth round he was basically shadow boxing. I don’t blame him because you have to be dumb to stand in front of me. We’ll make some adjustments and add to what I already do well. “Everybody knows my style. I’m not here to dance, I’m coming to fight. I’m going in there with my heart out to show the world that I’m still one of the best out there. “I feel strong and I feel rejuvenated. My body needed some rest because all of my fights are wars. It took a toll on my body and now I feel as good as ever. I’m ready to show the world a different Brandon Rios. “You have to fight the best to try to be the best. Danny Garcia has been up at the top of this sport for a long time. I’m always ready for a test. “I used to not always take training and my weight as seriously as I should have. I was young and dumb and I made mistakes. Those mistakes are in my past and I’m in great shape right now. “I’ve been training really hard to have a full gas tank on fight night. I could have stayed retired but I still have it in me and there is still more I can get out of this sport. I truly love boxing and I’m excited to be back in a big fight like this. “I’m always confident when I get in the ring. Having Robert Garcia in there is having my brother with me. It’s just another voice that I’m used to and that I trust. “Being back in the ring was a little bit nerve-wracking but I was happy to get the ring rust off. I did what I had to do and was happy to get through that experience. I’m really thankful to be in this position to fight Danny Garcia. “I have to make a statement on February 17. I’m leaving Mandalay Bay with the belt on my shoulder. I have to get the knockout and that’s what I’m looking to do. “It’s been my dream since I was a little kid to unify titles and that’s what I’m working towards now. I want to be one of the best in the history of the weight class and I’m working very hard to accomplish that. 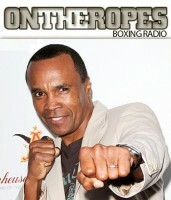 “I’m the youngest super middleweight world champion in history and I’m going to show Gavril why. I’m extremely motivated to look even better than last time and get the knockout. “I grew up in the era where everybody fought everybody. There was so much energy and excitement with each fight and that’s what I’m looking to bring to fans. This is going to be a great fight that you don’t want to miss. “I feel like I won the first fight clearly. Gavril thinks he’s going to come and knock me out now, but if he has so much confidence, he should have done that in the first fight. I’m training extremely hard right now to go in there and tear him up. “The strategy of this fight will be a little bit different. We have some things that we’re planning. But it’s still going to be a war, because I want to be a fan friendly fighter. I’m hoping to steal the show. “I’m the champion so I feel like I’m in a position to make some great fights in the near future. I want the winner of the World Boxing Super Series 168-pound tournament. I’m honored to be in the same column as the other champions and I can’t wait to get in the ring with them. “I didn’t think he was as good as people said he was going into our first fight. He hadn’t fought any real fighters, so you saw what happened when he went up against one. “I’m really happy to be here and be in this position for a rematch. I want to thank David Benavidez for agreeing to fight me. I thought that I won the first fight so I knew I wanted this immediately. I earned this rematch. “I learned a lot from the first fight. I know what I have to do better this time. The strategy will be adjusted and I’ll work even harder in camp to be ready. I’m working on being the best I can mentally and physically. “He’s a young fighter who still has a lot of things to learn. Right now he’s the champion, but he will have to be ready. This won’t be an easy fight for him. I’m going in there to hurt him and win the fight. “I can do a lot of things better than in the first fight. I proved that I have the skills in the first match, and now I will improve to get the win. I am here for a reason. It’s not going to be an easy fight for him. Website photographer, writer, press release editor. 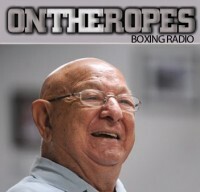 1 Response to "Danny Garcia and Brandon Rios square off for the first time ahead of their February 17th clash"
Rios is perfect for Garcia. You give fighters coming off a loss or lay off BAM BAM as he makes anyone look good.